It’s only a small portion of an adult’s time every week, but it has a profound effect on a child’s life. Now heading into its fourth year, The Rotary Club of Summit County’s Reading Buddies program has helped participating children make leaps and bounds in their ability to read, volunteers say. The initiative is especially important since reading is basic to most things in life – “You can’t do math without reading. You can’t practice music without reading,” volunteer Don Parsons said. The program pairs volunteers with children – grades kindergarten to sixth – to help students develop reading and writing skills. The goal is to inspire young students to become effective and enthusiastic readers, and originally only focused on students needing a little extra support. Now, it serves students at all developmental stages of reading proficiency. The program takes place at Summit County elementary schools, where teachers elect students for buddies. Children are then paired with volunteers who work to encourage the students while they’re reading. Volunteers help children stuck on certain words, assist them in finding meaning during their reading and offer support while they read. Pam Minard, literacy resource teacher for Summit Cove Elementary, has seen the confidence in students with buddies soar. Sometimes the books fit with the students’ reading level, and sometimes they are related to the school’s curriculum, which leads to more discussion about the concept, Minard said. “For the most part, it is time for a student to enjoy a book with an adult,” she said. Parsons, who has been involved with the program for a year, signed up because he feels reading is an important part of a child’s education. Those who fall behind need that individual attention, since they can “get lost in the shuffle,” he said. The first-grader Parsons worked with last school year made significant progress. “Initially, he didn’t even know the alphabet. He had a lot of trouble, even with two- or three-letter words,” Parsons said. Now, the boy is reading grade-level books, and has taken to bringing them home to share with his family. “Considering where he started, it was huge progress,” Parsons said. Wendy Blasingame’s Breckenridge Elementary kindergarten classroom had a volunteer visit last school year (who is returning for the current) to help individuals and small groups of students. 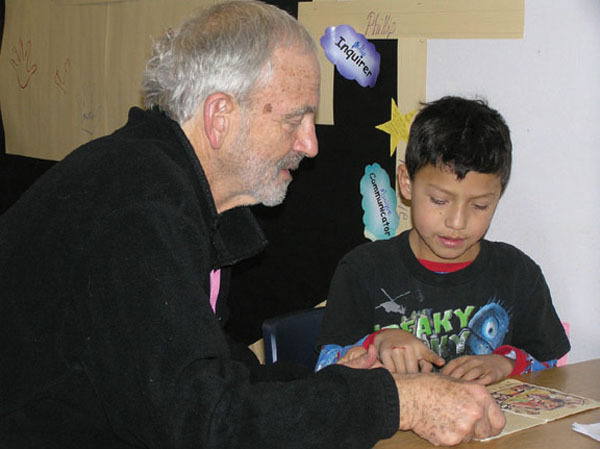 The reader – a retired Spanish teacher – was especially helpful for the English-language learners – Blasingame saw a big change in the proficiency of students, who were excited for each and every visit. In her few years as a volunteer, Barbara McCuskey has learned that it isn’t all about reading with the students – sometimes they need someone to act as a mentor. “With both of my prior students, we had fun. It started with just reading for an hour, which is a long time for an elementary student. It quickly evolved into working on a lot more than reading, also comprehension, math, writing and learning how to apply those skills every day,” she said. McCuskey helped the students with their goals, and they learned to honor commitment, she said. Their greatest achievements were when they were able to articulate their wants and needs, master the task at hand, and feel more comfortable about moving onto middle school. “Confidence is so important,” she said. McCuskey – who doesn’t have a professional teaching background, and was unsure at first about whether or not she could make a difference – believes that an education makes the difference between making it in life, and just getting by. Anyone who wants to give back to the community and make a difference in the future of students should sign up, she said. Volunteers don’t need to have a teaching background, and they receive support and encouragement from the schools and Rotary along the way.